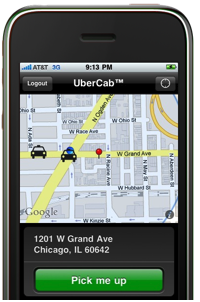 Know about Uber yet? It’s one of those startups that I’ve been fascinated with since I first heard about it last summer. It lets you call for black car service via a mobile application, watch it come to you via GPS, and all charges are automatically billed to your credit card. In the future I think the service could expand to let anyone become a “driver,” much like AirBnB lets anyone rent out their home like a hotel. For now though the service is limited to black car services and is available only in San Francisco (and one fun night in Paris). The company was founded by entrepreneurs Garrett Camp, Travis Kalanick and Oscar Salazar. They hired Ryan Graves on as CEO (see our interview here). They found him via a post on Twitter. And now Ryan is passing the CEO torch to Kalanick. Ryan’s comment about the switch: “Personally, I’m super pumped about how well rounded the team has become with Travis on board full time.” His new title is General Manager and VP Business Operations. Kalanick has been on the bench for two years after selling his previous company to Akamai. He’s focused on angel investing since then. People are seriously pumped about this change. See the whole Uber blog post here.